"Explore American roads on an 18 wheeler truck!" Game Goal: Take on American roads driving super equipped cargo truck. How to Play: Control a truck in three countries (United States, Canada and Mexico) and take on slippery roads, storms and fog among other obstacles. Unlock and customize new trucks. Graphics: The variety of environments makes the game very dynamic, with a lot of care going into the graphics, especially the trucks. Controls: Tap or slide your finger across the screen commands (steering wheel, brake, throttle and gear) to control the truck. Developer: Ovidiu Pop is based in Romania	- TOP Developer: Trusted, high-quality developer. 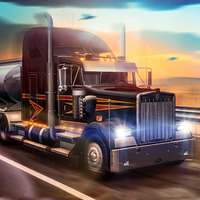 Do you like Truck Simulator USA? Hope to see more from you guys in 2017!